You never know when your name will appear on the Internet and for what purpose. Periodically we google ourselves to see what is out there. Today, Wayne found this reference in the Powell River PEAK, the online version of the local paper for Powell River, BC. We are away from our BC home at the moment, so it was a surprise. In this instance, our google search brought us good news. Here is the text from the article. You can also view it by using this link. 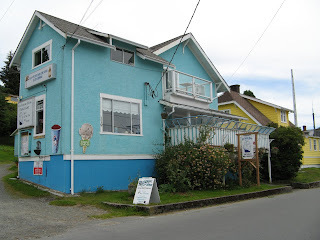 Powell River Books publishes books about the people and places of coastal British Columbia. The focus of these books is on the people of Powell River and the recreation destinations of the area. The business is located at #302 4511 Marine Avenue, which is a home office, from which there are no sales. Wayne and Margaret Lutz, originally from Pomona, California, own and run this new business, and they are the only members of the corporation's board. Current publications include four titles in the series called Coastal British Columbia Stories. The books are: Up the Lake, Up the Main, Up the Strait and Up the Winter Trail. Fall weekends are a wonderful time for quad rides in the Powell River backcountry, but be on the lookout for logging trucks that might still be working. Don't have a quad or bike? Many of the trips along logging roads can be taken by jeep, truck, or even car if you are careful and know when to stop. Blue Ridge is a great choice. 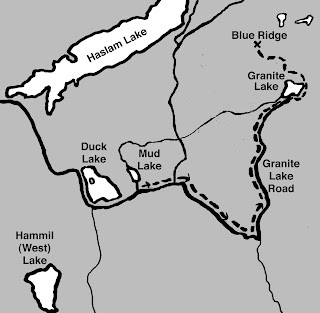 To get there, you take Haslam Steet out of Cranberry to Duck Lake Forest Service Road. At the south end of Duck Lake you make a left and cross the bridge where Lang Creek tumbles on its way to Malaspina Strait. We like to park a few miles up the road at the trailhead for Mud Lake. Here we offload our quads and follow the road to the Granite Lake turnoff. The road narrows then becomes a trail past Granite Lake up to the viewpoint called Blue Ridge. The last portion of the trail was built by our friend John and his quad buddies. Wayne calls them the "Pruners of the Wilderness" and you can read all about their trail building expertise in the Coastal BC Stories book Up the Main. From Blue Ridge you can look down on the deep blue waters of March Lake surrounded by the vibrant green of the forest. Look to the northwest and see Haslam Lake winding its way down towards Powell River to provide them with cool, refreshing drinking water. Yes, that's John's famous dog Bro. Look to the west across Malaspina Strait to Texada Island and Vancouver Island beyond. People talk about the beauty of places like Yosemite, and how enthralling it is to see the valley as it stretches below framed by El Capitan and Cathedral Rocks. The Powell River backcountry isn't a national park, but I think its beauty can rival any of them. What do you think? September is a great month to cruise in Coastal BC. The crowds are gone and you can find quiet anchorages. The weather is warm and still feels like summer. The day after Labor Day many seasonal business close, but there are enough year-round facilities to make late cruising a good choice. 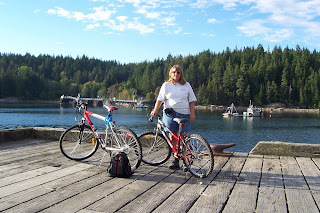 Here's one September trip we took to Cortes Island. 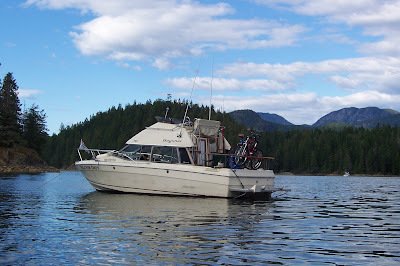 We started from our home port in Powell River. Our first stop was at Lund for fuel and goodies from Nancy's Bakery. 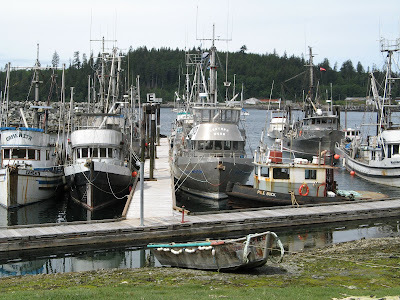 Lund is an excellent stop for boaters (and land travellers) on the northern tip of the Sunshine Coast. It has fuel (be careful, winter hours start in September), the historic Lund Hotel with it's excellent restaurant and lounge, general store and, of course, Nancy's. Be sure to visit the Tug-Guhm Gallery and talk to the owner Debra Bevaart. The gallery includes her own beautiful stone sculptures, art items from over 40 local artists and the Coastal BC Stories books by yours truly, Wayne. 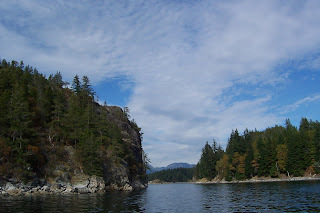 After our quick stop we headed north up Lewis Channel along the east side of Cortes Island and then into Sutil Channel on the north side. Our destination for the first night was Von Donop Inlet. Von Donop cuts deep into Cortes Island, almost all the way through to Squirrel Cove on the east side. Von Donop (Ha’thayim) is a Provincial Marine Park where wilderness abounds. We found a protected anchorage at the head of the inlet. With only a few boats, there was plenty of room for all of us to have our own private space. I bet it wasn't this way a week ago. Once our anchor was down, we launched Mr. Bathtub, our not-so-trusty dinghy. 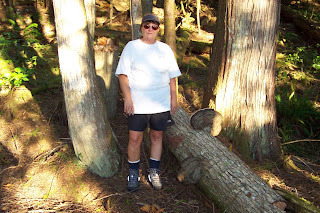 He took us to shore in search of the trail across the island's narrow isthmus to Squirrel Cove on the opposite shore. 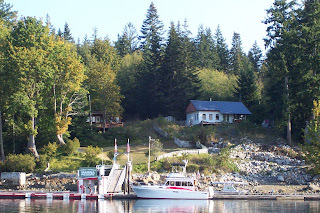 On previous trips we had anchored there and knew that Marilyn's Salmon Shack had great salmon burgers and blackberry pie. It was the day after Labor Day, so we departed with hopes that closing day hadn't yet arrived. But after a long walk on the well marked trail there was no Marilyn, no salmon burgers and no pie. No matter, the solitude of the wilderness and some fresh baked pizza from Nancy's back at the boat was reward enough. We got a lazy start the next morning. The sun was warm and encouraged lounging on the aft deck. We departed before lunch and rounded the west side of Cortes and heading for Uganda Passage, a narrow channel of water between the Cortes and the sand spit off nearby Marina Island. We went slow following the marker bouys to stay in the deepest water. The entrance to Gorge Harbour is impressive. Massive granite walls loom upward from the water's edge. On one wall there are ancient petroglyphs, but for us they were hard to spot. Once inside a wide bay with islands in the middle opens before you. We cruised by the government dock, but it was full of classic work boats. 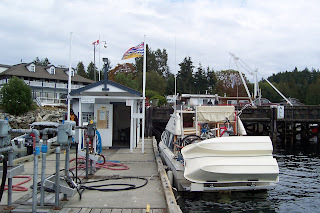 We then headed to the Gorge Harbour Marina Resort dock for fuel and inquired about an overnight stay. Space obviously wasn't a problem. The many fingers were virtually empty this second day after the close of the tourist season. 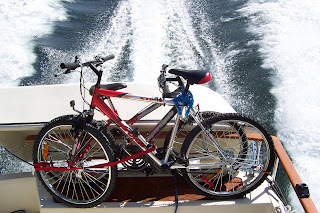 We brought our bicycles with us strapped to the rear railing. Wayne read an article about riding on Cortes and we wanted to give it a try. On the way out to the main road we stopped at the resort store (nicely stocked) and to make reservations at the restaurant for dinner. We love to cruise, but hate to cook when other options are available. At Whaletown Road we turned left. Cortes is a hilly island. Wayne does better in such conditions, but he was patient as I walked my bike up the crest of many a hill. 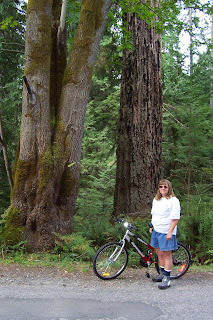 The scenery was beautiful with many old (at least older) growth trees. At Carrington-Bay Road we turned right to the ferry terminal. This ferry connect Cortes to Vancouver Island via Quadra Island. It takes both car and foot traffic. At Harbour Road we took another left and went down the steep hill to the ferry dock, and I mean steep. There were spots where I had to walk in both directions. Just before the ferry there was a vendor offering pop, tea and ice cream at the front of her home. We rested awhile on her deck enjoying a cold drink and ice cream bars. Her garden was amazing! After struggling (at least for me) back up Harbour Road we retraced our steps to Whaletown Road. This time we turned right to go down to the village on the bay. As the name Whaletown implies, it was a thriving whaling stations established here in the mid-1800s. Today it is a quiet village of homes and a few shops including the General Store. Our return trip to the resort seemed shorter (thank goodness). We were rewarded at days end with an excellent fresh salmon dinner with all the trimmings. It's easier getting up in the morning when tied to a dock, at least for Wayne. No climbing around the cabin using the handrails and no anchor to haul aboard. We used the extra time and energy to make some "BBQ" coffee to have with our sweet rolls from the resort store. It was time to travel from Washington to California again and 997 was rearing to go having just come out of her annual inspection. Every year we think it will be a quick process, but as usual it took almost a month. We departed Bellingham IFR to practice with our new IFR certified Garmin GNS 430. After departure we followed V165 southeast along Whidbey Island. This route kept us west of the congested Seattle airspace. At Olympia we picked up V204 to Hoquiam and then south on V27 all the way to Southern California. We like this route because there are usually fewer bumps and buildups over the cooler coastal waters. 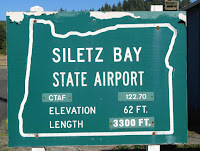 Our destination for the first night was Siletz Bay Airport (S45) at Gleneden, Oregon. It is our favorite stop southbound when skies are clear (there's no IFR approach). We camp next to our airplane so we can get an early start in the morning. 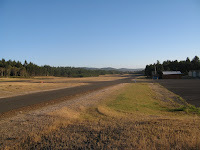 If there are low coastal clouds, Tillamook Airport (KTMK) is an alternative airport that has an IFR approach with airplane camping. 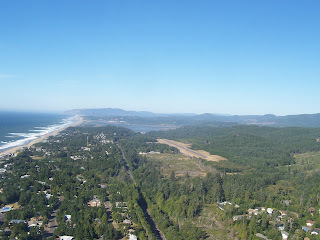 The Side Door Cafe is within walking distance of Siletz Bay Airport. This is handy since we don't like to carry all of the supplies needed for cooking. Tillamook has a more improved camping area, but a taxi is needed to get to town and restaurants. 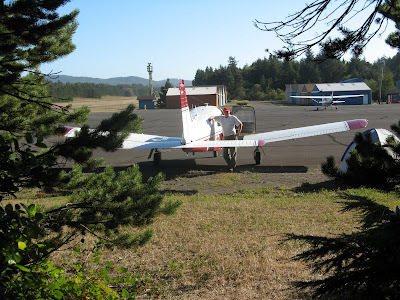 We were up bright and early at Siletz Bay Airport. We planned our fuel so we would be light for takeoff. A 3300 foot runway can be a little tight when our Piper Arrow is loaded. But with 10 gallons burned out of each wing and a cool morning were up and away with no problems. We rejoined V27 southbound. 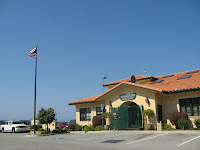 Our intended destination was Arcata Airport (KACV) in Eureka, California, for fuel and brunch at the Silver Lining restaurant in the terminal. 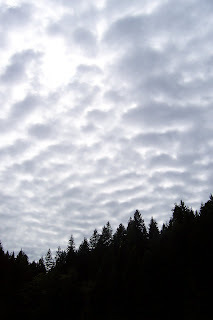 But at the California border we encountered low coastal clouds. A check of the ASOS told us that the weather was below minimums even for IFR. We picked McNamara Field (CEC) at Crescent City as our alternate. They have self-serve fuel, but no food unless you count the candy bars at the FBO. It was a good thing we saved our cheese cake from the Side Door Cafe the night before! After a quick turn around and we were back on V27. Coastal clouds gave way to haze. 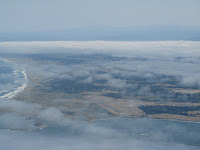 We flew out over the water west of the busy San Francisco airspace on our way to Monterey Peninsula Airport (KMRY). This time we would fill both our tanks and tummies. On our last trip north in 997 we spent three days at Monterey waiting for alternator repairs. This time there was just enough time for a good meal at the Golden Tee restaurant while 997 guzzled her drink of choice just like a "Million Air." What an honour! 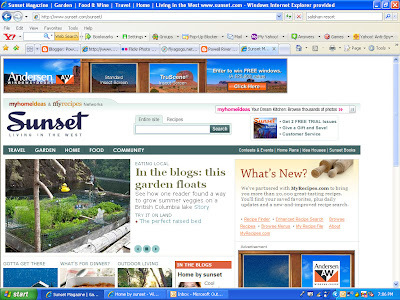 My floating garden was highlighted today on Sunset Magazine's website www.sunset.com. Sheila Schmitz, Sunset's online editor, wrote the article "Gardening on top of a lake" describing the floating garden you've read about here at my blog. You can read her complete article on their "Home by sunset" page by clicking here. In addition to the article, a picture and caption about my garden is included as one of eight stories featured in their web page banner. Thank you Sheila for the great opportunity and coverage! 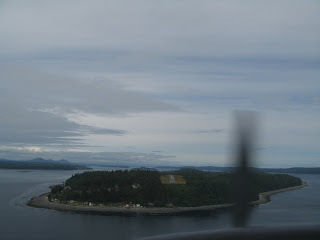 This summer we flew to Alert Bay on Cormorant Island near the north east coast of Vancouver Island. The island is the traditional home of the 'Namgis First Nation. The village of Alert Bay is the oldest North Island community, built in the late 1800's to support local fishing, logging, canning and trading. We departed Powell River late in the morning. There were still some low clouds, but they were starting to burn off. Fifteen years ago we camped next to our plane at the Alert Bay airport. Like before, we walked from the airport to town through quiet residential streets. It was amazing, everything looked the same. When we got to Front Street we walked to the ferry terminal. BC Ferries departs from Port McNeil on Vancouver Island to bring you to the heart of Alert Bay. You can bring your car or walk on. In Alert Bay, you can reach almost any destination in town on foot. Tourist services and activities are limited, but that isn't a bad thing. There's a waterfront seawalk, a marina for pleasure and commercial fishing boats, art galleries, shops, a library/museum, totem poles in the 'Namgis burial grounds, a cultural center and the world's tallest totem pole reaching 173 feet. There's also a co-op with everything you might need. You can also see the old cannery on pilings extending into the bay. There are several bed and breakfasts, cabins and lodges if you want to stay the night. 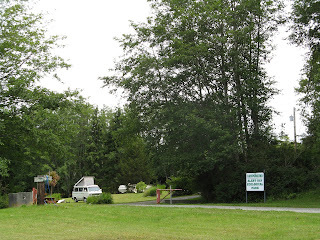 There's also a nice campground near the Ecological Garden on Alder Road. The garden has a nature trail leading through marsh lands and cedar forests. We ate at the restaurant located in the old Custom House building on Front Street. Our waitress was an enthusiastic young woman who grew up on the island. 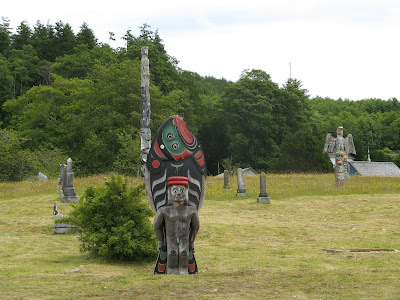 After lunch we walked to the burial grounds to view the totem poles. From there we hiked back up the hill past the Tribal Recreation Center and back to the airport.